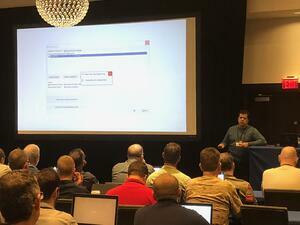 Technical sessions included deep dives into new development techniques and power features of Alpha Anywhere and Alpha TransForm products. 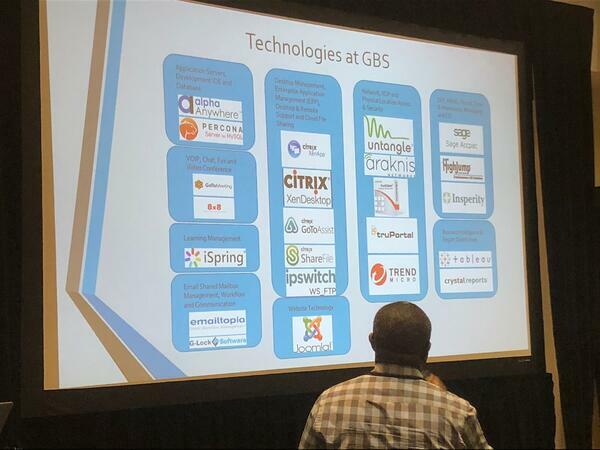 Attendees participated in demos and instructional sessions around stylizing apps, analytics and reporting, fast mobile app deployments and redeployments and optimizing cloud deployments. 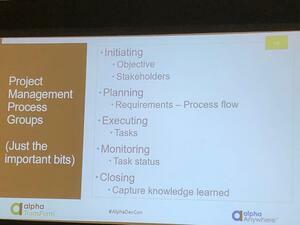 Attendees also had the opportunity to schedule 1-on-1 "Meet the Alpha Doctor" sessions, which provided a private, 30-minute session with an Alpha Software solutions engineer to review an app, strategize a new app project, troubleshoot a problem, or learn how to implement a new product feature. Many developers at the conference this year are tasked with dramatically speeding app development and delivery, and breaking the app bottleneck. 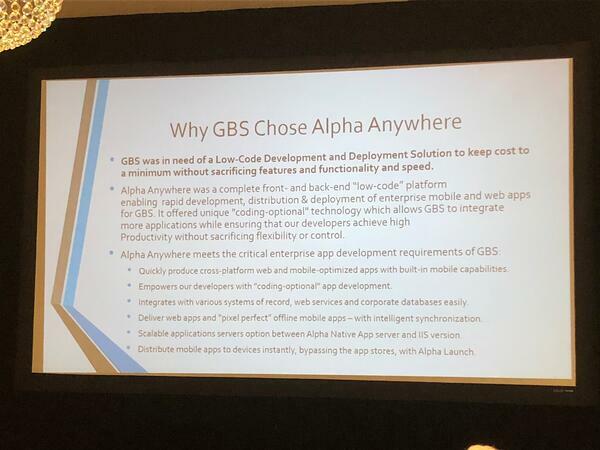 Greg Bohling, Director of Technical Services at Alpha Software, presented Managing App Delivery in a Decentralized World which tackled the dilemma: "How do I empower my line of business users to solve their mobility needs while preventing everything goin off the rails?" 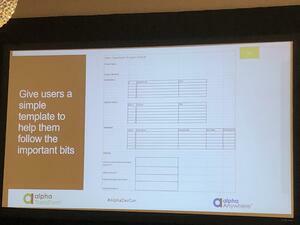 He explained why Alpha TransForm is ideal for meeting the challenge. 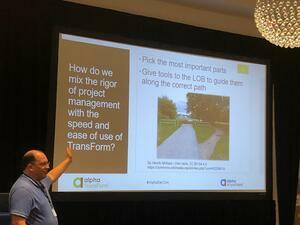 Bohling next walked attendees through best practices for empowering business users while guiding through better project management, and offered attendees free access to a valuable Alpha TransForm app that helps them engage with users and drive the process. XAPP Design is a web and mobile app development firm that utilizes the Alpha Software Platform, including Alpha Anywhere, Alpha TransForm and Alpha Cloud, to deliver a number of different Alpha based solutions and services to its clients. 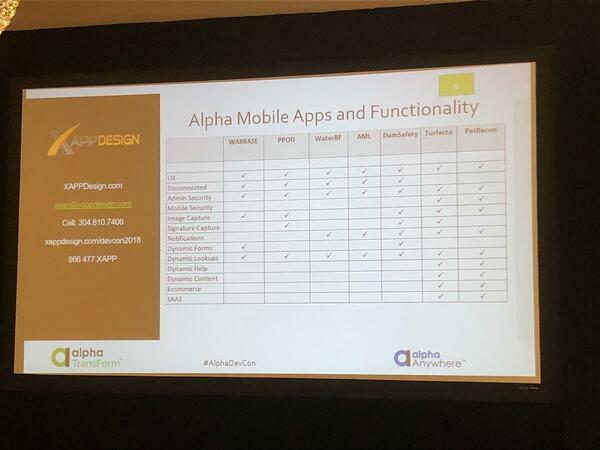 O'Kelly shared an interesting slide showing a small sample of the apps that XAPP has built using Alpha Software products for its clients with a chart of some of the feature combinations included in those apps. 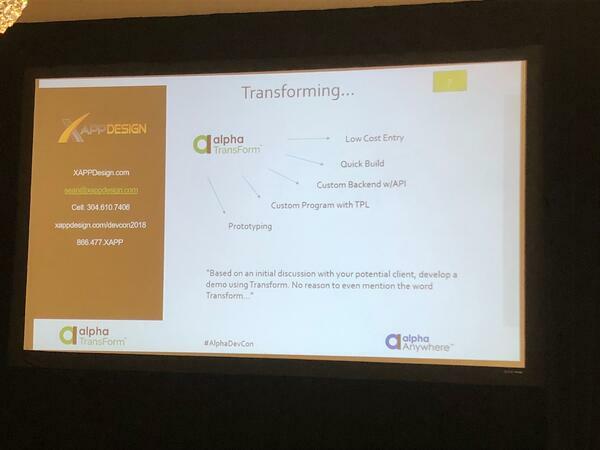 He was particularly bullish about Alpha TransForm and mentioned that XAPP Design is building a sales force to grow the business based on new Alpha TransForm business. He discussed several benefits to TransForm, including low-cost entry, fast prototyping and quick app builds, custom backend using the TransForm API, and custom programming with the TransForm Programming Language. 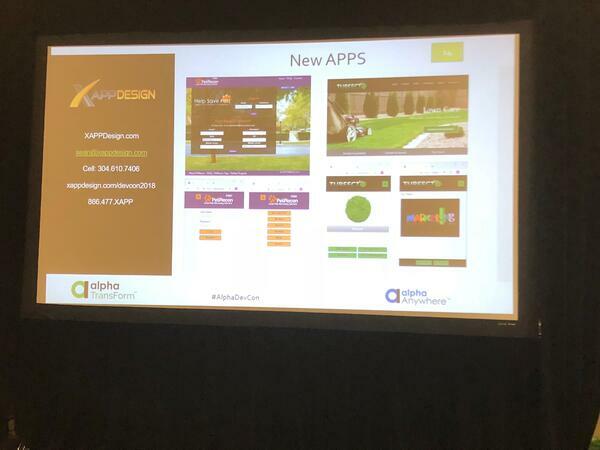 O'Kelly shared an interesting slide showing a small sample of the apps that XAPP has built using Alpha Software products for its clients with a chart of some of the feature combinations included in those apps. 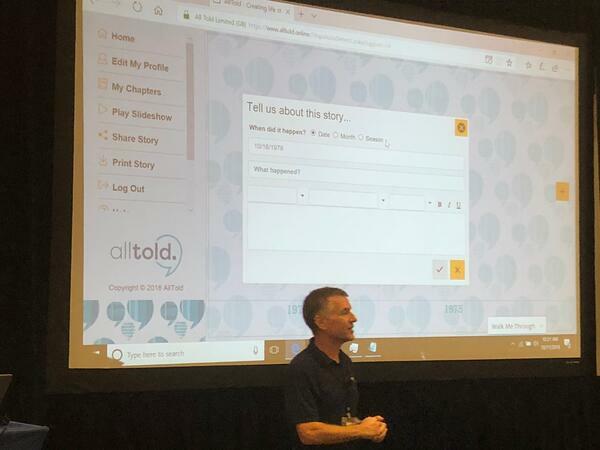 Robin Bennett of Start Software told a fascinating story about how the AllTold® app project is designed to help senior citizens combat social isolation and loneliness and strengthening their memories. Research shows that storytelling can be used to enhance social, physical, and mental well being in seniors. The app, developed by Robin Bennett and a former British counterterrorism expert, enables senior citizens to record and share their life story on a mobile device -- essentially a digital scrapbook of memories and photos -- for family and friends. 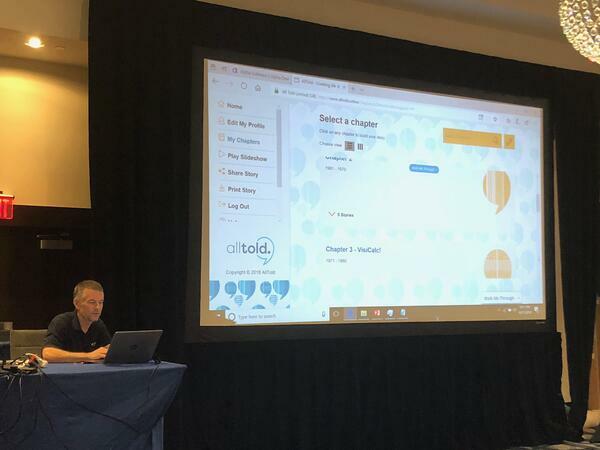 As part of the presentation, Bennett demonstrated how easily and quickly the app can capture life events, add images and tag memories, then share the data in many ways or even as a PDF document. Why build it in Alpha Software? We were confident it would scale reliable and easily, and we knew Alpha would provide a solid framework without ANY restrictions. 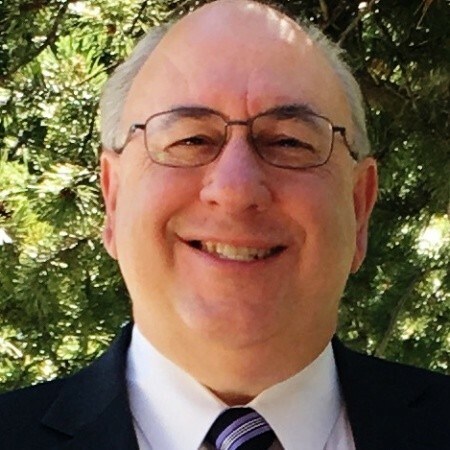 He explained that Humana Healthcare is currently conducting a pilot of the app, and the company currently has more leads than they can handle, including law enforcement agencies looking to record incidents. 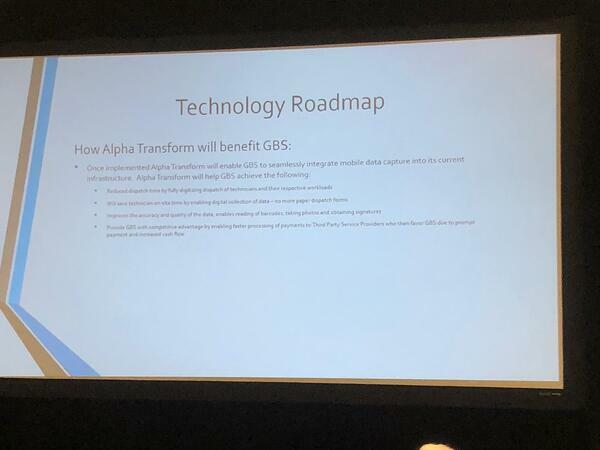 Bennett also discussed some of the ways he imaged utilizing Alpha TransForm in the future. 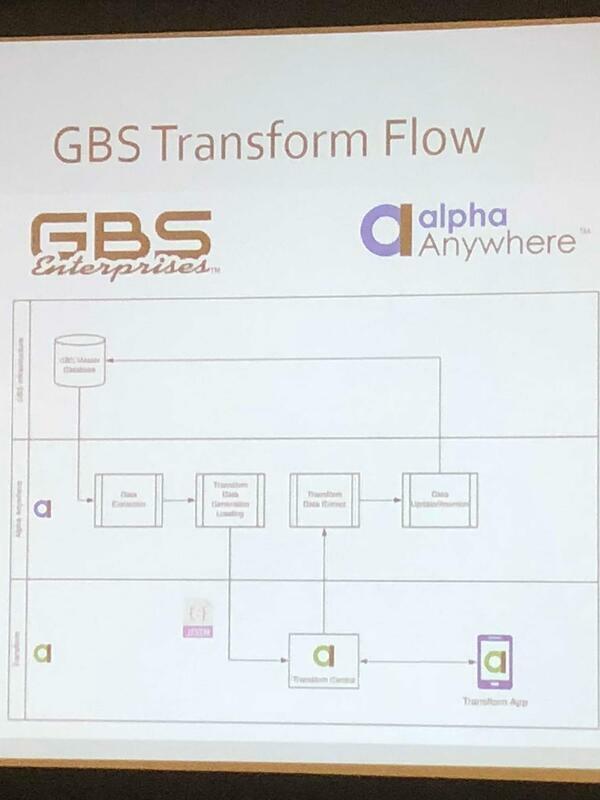 GBS Enterprises, a nationwide provider of furniture protection services, uses Alpha Anywhere and Alpha TransForm to optimize and mobilize its business. 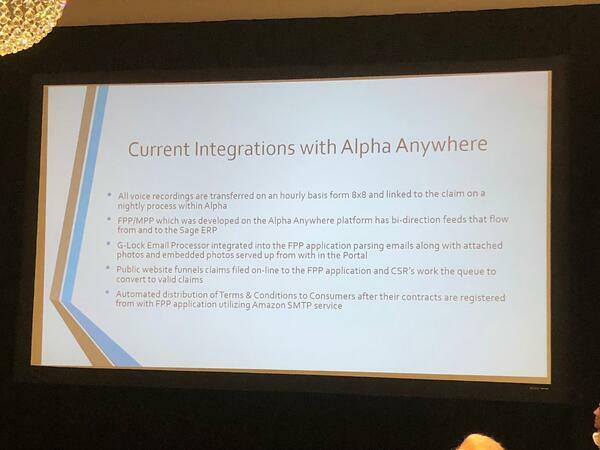 d'Almeida discussed the company utilization of Alpha Anywhere to develop its front office and back office systems, including a complete call center and service dispatch application. 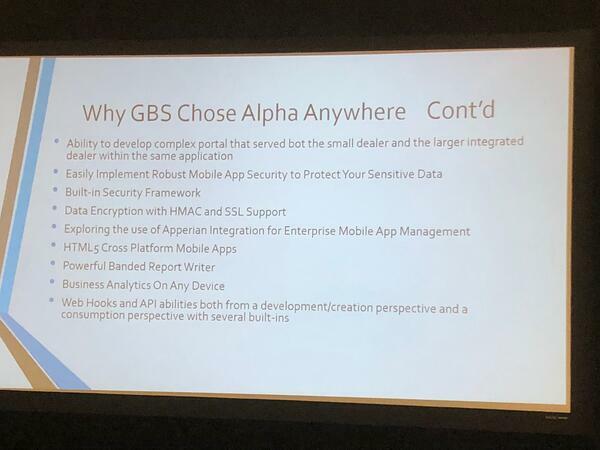 He shared a slide showing some of the technologies Alpha Anywhere needs to integrate with to help run all GBS systems. 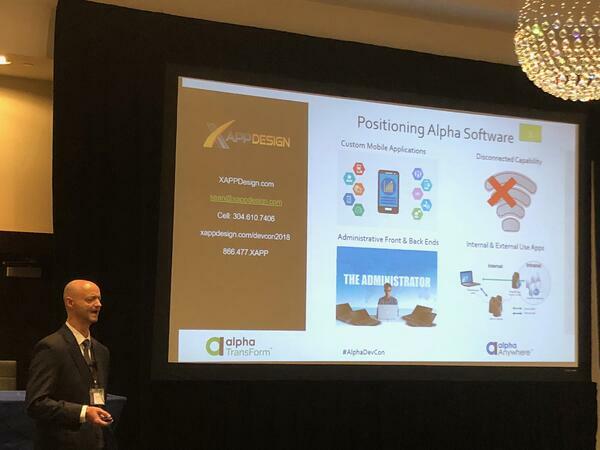 To increase operational efficiencies and customer satisfaction, the company is mobilizing field work by incorporating mobile service dispatch apps into the business using Alpha TransForm. 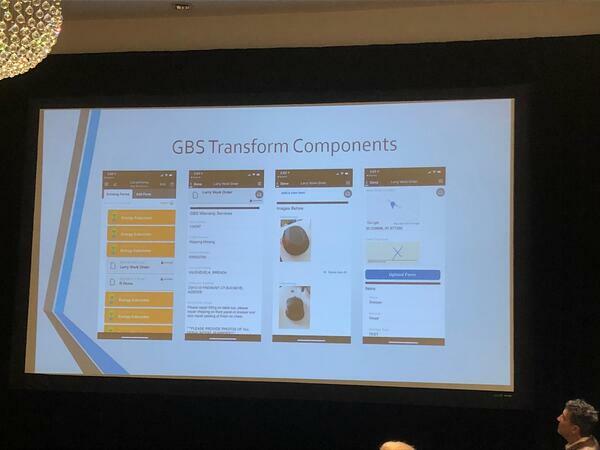 GBS has a team of 200 operators receiving and logging customer requests and initiating work orders, at time, reaching 300 work orders across the US per day. The company is working with Alpha Software to reduce on-site service time and expedite transaction processing, increasing both operational efficiencies and customer satisfaction. 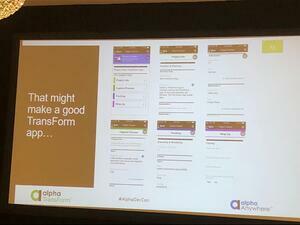 d'Almeida showed examples of work orders that were once down on paper that are now done via mobile devices using Alpha TransForm technology. Technicians using the app are improving onsite data collection, capturing images and scanning bar codes and initiating or processing claims. With the introduction of the mobile app in the field, GBS realized 80% increase in productivity in the field. A demonstration on how the two products work together and seamlessly integrate to make IT developers more productive, while allowing business users to developer their own mobile apps. How the products play well in the enterprise by enabling role-based interfaces for collecting, accessing and analyzing information without disrupting existing systems. What features are planned in the future platform roadmap that will make enterprise mobile app development easier for both IT developers and line of business users. Alpha DevCon 2018 continues through Friday. Get more details on Alpha DevCon.